Float Plaques: FloatPlaques give your art dimension to appear as if it is floating off the wall. Float Plaques are quickly becoming a favorite for fine art galleries and artists alike. Made from our premium eco-friendly wood, Float Plaques create a durable yet creative way to preserve and present fine art. Artwork is mounted on an acid-free 3/8” thick surface, finished with a beveled edge, and given a ¾” deep backing to create a floating effect. Float Plaques: Float Plaques come ready to hang. The backing is recessed from the edge such that it is not easily seen. A simple French cleat system is provided to securely mount and display the Float Plaque..
Alumapress Prints: Dye-sublimation ‘infused’ aluminum is one of my favorite ways to have my artwork printed. These prints are on trend with today’s leading-edge technology and dye sublimation aluminum products exceed industry standards! 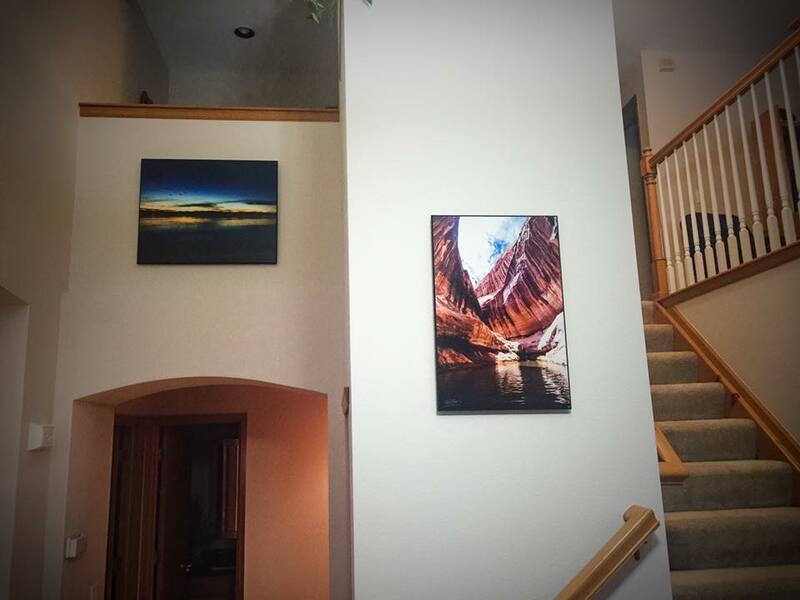 Alumapress Prints: These prints come ready to hang and their colors are vibrant. The sheer metal base illustrates a unique a sheer aluminum effect to illuminate the iridescence and allure of metal through the artwork. This is a remarkably modern presentation playing up the unique, boldness of metal with a super gloss finish. A protective, acid-free black coating is applied to the back of the infused metal and is completed with a black 1/2” recessed backing with concealed French cleat hanger to give it a floating effect when mounted on the wall. This is a custom Alumaprint measuring 6 feet wide. Please feel free to contact me if you would like a custom sized print!